How Do You Define Sport? How do you define sport or athlete? 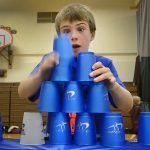 There are nearly 60 events in the Summer and Winter Olympics, but each year there are some that get people to stop and ask, “How is this a sport?” And then there’s another event that’s become very popular in competitive sports world — Sport (Cup) Stacking. Watch the video below to learn about this fast growing sport! Then reply to this post with a response to the question — What makes cup stacking a sport? Nature’s Light Show	Can They? Yes They Can. Cup stacking is a sport because in every sport you need stamina and you also need to practice and try differently. I think cup-stacking is a sport because you need stamina in it and you have to concentrate like in every sport. And you need to practice, too, like in every sport. You need to focus on stacking the cups really fast, and you have to move your hands really quickly. I think cup stacking is a sport because like in all sports you need lots of focus and stamina. And you can’t go slow because what you do in cup stacking is you try to go as fast as you can! Sophia did you read mines yet? yes! it’s very very good Grace I love it just like the one yesterday! Thank you Grace your’s is cool to ans your’s is very good like the one that we did yesterday! Thanks, Sophia, you’re so nice . . .
You too Grace! your so much nicer then me did you now that? your so much nicer then me! What makes Cup Stacking a sport? Well Cup Stacking makes you focus and have control over your body, just like other sports. For example in swimming you should have technique as perfect as possible and you will go faster. Also, in Cup Stacking the better the technique the faster you’ll stack the cups. Cup stacking is a sport because you need to practice and have speed. cup stacking is a sport because in every sport there is a athletic ability you need to have to play the sport and in cup stacking the ability you need to have and in cup stacking the ability is to fast hands. you also need to have a lot of focus because if you do not have focus you might drop the cups. What makes Sport stacking a sport? Sport stacking makes you focus and have better eye and hand coordination like Ping-pong and Paddle ball. Also, in Sport stacking the better the technique the faster you’ll stack the cups. need to practice just like other sports. Also you compete against other people just like most sports. I think cup stacking is sport, because cup stacking makes stamina to faster and everybody needs practice to be good like sports. Cup stacking is a sport because you need a lot of concentration. Is There Such Thing as Too Much Technology? Can They? Yes They Can.